23 April - 26 September. This extremely large, sprawling site of 4.5 hectares is split by the Umag - Savudrija road. 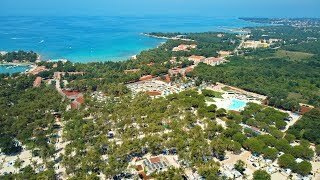 The camping site and reception is to the east of the road and the amazing Sol Stella Maris leisure complex, where the Croatian open tennis tournament is held (amongst other competitions), is to the west and borders the sea. Located some 2 km. 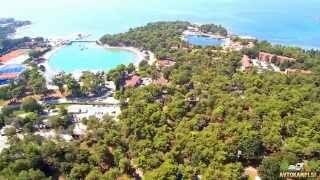 from the centre of Umag, the site comprises 575 pitches of which 60 are seasonal and 20 are for tour operators. They are arranged in rows on gently sloping ground, some are shaded. The pitches all have 10A electricity. The site’s real strength is its attachment to the leisure complex, with numerous facilities available to campers. There are two swimming pools (one sea water) and a very pretty pebble beach area where sun loungers may be hired. There is a huge entertainment area and the choice of seven restaurants and bars including a cocktail bar and buffet bar with great sea views at night. Boats may be launched or hired at the marina and bikes hired for some challenging tours of the area. Three sanitary blocks of a very high standard. Hot water throughout. Excellent facilities for disabled visitors. Laundry facilities. Large supermarket. Huge range of restaurants, bars and snack bars. International tennis centre with pools and beach area. Watersports. Fishing (permit required from Umag). Entertainment programme and clubs for children of all ages. Communal barbecue areas. Excursions organised. Site is 2.5 km. north of Umag. 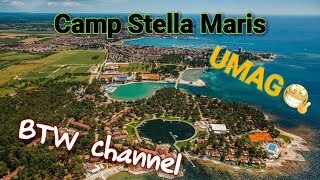 On entering Umag look for signs on the main coast road to all campsites and follow the Stella Maris signs.